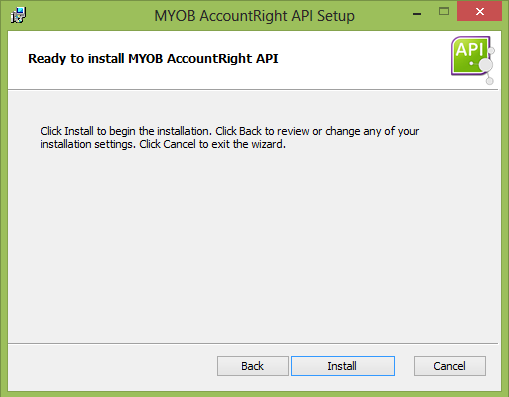 When installing MYOB AccountRight 2014.1 or higher there is a choice between two installation editions. The PC Edition and the Server Edition. The Server edition requires a separate install of the API as it needs to run as a service which is independent of the users logged on to the machine. This help note explains how to install the API. 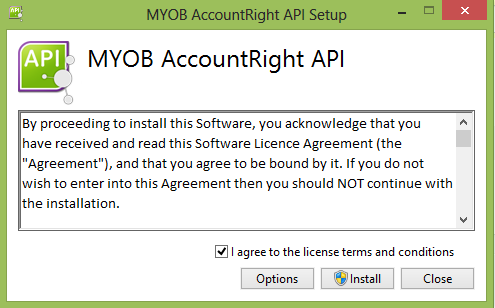 If you are unsure which edition you should use, please refer to MYOB's Help Note: Which AccountRight installation should I use? The PC Edition does not require separate installation of the API as the PC edition runs an Add-On Connector in place of the API. For the technical people out there the difference being the installed API on a server runs as a service where the Add-On Connector is an application that runs when the user logs on. NOTE: Offline accounting files are not supported by Calxa online (MYOB AccountRight Local/Network libraries). You must have an online accounting file to use an online workspace. 1. To install the AccountRight API you need to run the Install AccountRight API application. 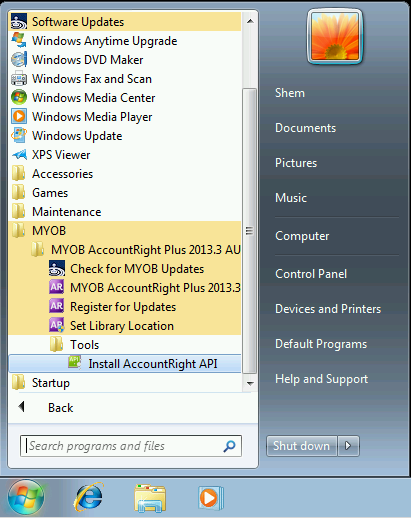 Depending on your operating system the screenshot below may differ but the API installer will be available provided you have MYOB 2013.3 or higher installed. 2. If you agree to the terms and conditions mark the box labelled I agree to the license terms and conditions. Then click Install. 3. Step through the installation wizard, we recommend using the default settings. Click Install on the final page of the wizard. 4. When the install is complete click Finish.